This really will be just a jot today because we are getting ready for daughter E and granddaughter ABC to come home from London, where they have been visiting with son-in-law L for almost a month. We need to finish up the toddler-proofing that we had undone/ignored while ABC was away. There will be some time with Nana and Paco, as there usually is every day, but we need to leave for the airport mid-afternoon. Unfortunately, the flights didn’t work out to come to our local airport, which only has one carrier and three flights a day, so we will need to take an hour and a half drive to pick them up. After dinner near the airport, we will all head for home in our hybrid Pacifica. Although we will get back here between 8 and 9 PM, it will feel to E and ABC like 1 to 2 AM, so there may be napping on the way. Everyone at my house and Nana and Paco can hardly wait to have E and ABC back with us! 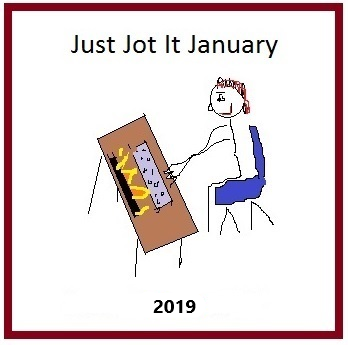 Author Joanne CoreyPosted on January 13, 2019 January 13, 2019 Categories blogging, family, Just Jot It January, musings, travelTags airline, airport, home, JusJoJan, Pacifica, reunion, toddler2 Comments on coming home! Whilst I have been busy with grandbaby ABC and my parents and the fall activity start-up schedule, I have also been preparing for the second reunion of the Boiler House Poets at the Assets for Artists residency program at MASS MoCA in North Adams MA. You can read about our first residency as the initial group of poets in the partnership between Tupelo Press and MASS MoCA in my archives for November 2015 and our first reunion in early October of 2016. I should probably rephrase that. I should have been preparing, but I was too distracted with everything else going on, so I threw things together last night and this morning, complicated by my printer still thinking it is British rather than American and not being able to cope with printing on 8.5×11 inch paper. Even though my older sister has arrived to help my parents and B is back from his business trip to help E care for ABC, it was very difficult to leave, but fortified by hugs and kisses from E and a last snuggle with ABC, I set off for the 200-mile drive back to North Adams. I grew up near North Adams and went to high school there, so it does feel like coming home when I visit, yet, so much has changed that it feels like there are discoveries to be made, too. I am looking forward to visiting the expansion of MASS MoCA that has opened since our last reunion. And there is no shortage of work to be done. Today, though, was about re-establishing bonds with the other poets and greeting a new member, as well as a visual artist who is also participating in a residency this week. We had a lovely welcome dinner together at Grazie, which is just below our apartments. We talked and talked and ate and talked and had gelato and talked some more, catching up on what has happened over the last year and laying the groundwork for our time together this year. Whether you live in a city or a town or more rural area, weather always seems to be a topic of conversation. For example, at my recent college reunion (which – shameless plug – you can read about here and here and here), we talked a lot about rain. Our commencement thirty-five years ago had had to be moved indoors due to rain, which limited attendance to only two people per graduate and caused all manner of disruption. (This was before the construction of the spacious indoor track and tennis facility that would now be used if weather forced a move indoors.) We have also had some remarkably rainy reunions. This year, we had lots of rain on Thursday and Friday, but Saturday was lovely for our parade, outdoor meeting, and evening illumination of campus. Some people still confuse weather and climate, though, which is very frustrating. Yesterday, I posted about the US and the Paris climate agreement. I have written a lot about climate over the years, which grew out of being a New York fracktivist. I and millions of other US climate activists will continue to do our part in accomplishing our country’s climate commitments and supporting other countries as they implement their own goals. We need to protect our planet and people from the worst ravages of climate change and from one of its components, an increase in severe weather. Saturdays are always the busiest days at Smith reunions. While our 35th is part of the second reunion weekend this time around so that we aren’t here to celebrate Ivy Day with the graduates, we still hold an Alumnae Parade. The alums all dress in white, with ribbon sashes and other accents in their class colors. The class of ’82’s color is red. After the the marching band, the parade continues with the eldest reunion class first. This year, I believe for the first time ever, we had a woman with us celebrating her 80th reunion! She is 100 years old! Incredibly, although there was both a wheelchair and a golf cart at the ready for her use, she chose to walk arm-in-arm with a companion! As she walked between the lines of alumnae waiting to follow her, she drew much applause and whooping. We should all be so blessed to be granted such robust health to be able to join in our own 80th reunions someday. The parade led us to seats on Chapin Lawn for our annual meeting of the Alumnae Association. We voted on new officers, listened to addresses from a just-graduated alumna and the college president, and found out our fundraising totals for the previous five years. I’m pleased to say that ’82 did very well. Next, we assembled box lunches and met at Stoddard Hall for lunch and a presentation by College Archivist, Nanci Young. Our reunion theme this year is ” Creativity, Connection, Community” and Nanci presented an overview of changing communications at Smith, using materials from the Archives. We had a lively discussion about the current state of communication and how people preferred to interact when face-to-face communication isn’t possible. Next, I chose to attend vigil Mass at the church up the street from the Quad. This highlighted the loss of the regularly scheduled services at Helen Hills Hills chapel, which had been such an important part of my personal and musical life when I was a student. I participated in many services of several religious traditions, as an organist, choral singer, and accompanist. I miss being able to attend Mass on campus when I return. Our final class dinner was held at Tyler House. A slideshow of photos from our student and alum days ran on a constant loop. We had final thank yous and the election by acclamation of new class officers. As we ate dinner, one of the storied a cappella groups on campus, the Smithereens, came to sing for us. Conversation and laughter were abundant. At 8:30, I met a friend from the class of ’81 who lives locally. It was a blessing to get to spend time with her, meet her companion, and catch up on our lives. We also enjoyed the illumination of campus, when hundreds of Japanese lanterns are lit along the paths of the botanic garden and central campus. We finally perched near the Student Center, where a jazz combo was playing on the terrace. It was a lovely day and a lovely evening. On Thursday afternoon, I arrived in Northampton, Massachusetts for my 35th reunion at Smith College. Thursday is light on scheduled activities, as many participants can’t arrive until later in the weekend, but it gives those of us who do have the opportunity to get started on heavy-duty reminiscing, as well as catching up on our current lives and loves. We spent hours chatting at our headquarters and over dinner at the Cutter-Ziskind House dining room. We reflected in a special way on the classmates we have lost over the years; our class memorial chairs thoughtfully prepared a compendium of our deceased classmates which brought each of them to mind for us. Friday presented us with a number of options for presentations and reflections. In the morning, I chose to attend a faculty presentation by Ellen Doré Watson, entitled “How Poems Mean.” It was held at the Poetry Center, of which she is the current director. We filled the room with women (and one spouse of the male persuasion) and read and discussed poems from a thick packet that Ellen had compiled for us, illustrating how poets convey meaning to readers/listeners. After the presentation, I perused the collection of poetry books and journals, spending the most time with the shelves devoted to alumnae poets. I was especially excited to see the books of Anne Harding Woodworth ’65, with whom I have sung with the Smith College Alumnae Chorus. Anne is one of my poetry godmothers, who has always been generous in giving encouragement and advice. I was pleased to have a bit of time to speak with Ellen personally after the gathering had dispersed. I hope to meet her again, perhaps for manuscript review through the Colrain conferences or when I return to campus. After lunch, a classmate and I walked around campus, enjoying the exercise, our surroundings, and conversation. We were able to visit Haven House, where I lived all four years. It has had extensive renovations since then, so it was interesting to see what had changed – which is nearly everything. I was touched, though, that our wooden mailboxes remain in place, even though students now receive mail through boxes at the Student Center. Even more amazing was that our napkin boxes are still there. In our student days, Haven had its own kitchen and dining room for our residents and those of our sister-house Wesley. We each had our own cloth napkin, which was kept in a labelled cubby near the dining room entrance, taken out and returned there for each meal. The college laundered them every week. Now, dining is concentrated in fewer locations with recycled paper napkins available, but I admit to feeling nostalgic for our student days with homestyle serving most evenings – and candlelight on Thursdays. Later in the afternoon, I helped to host the Alumnae Chorus reception, along with other Alumnae Chorus members from the class of ’82. We are always on the lookout for other singing alums to join us for events, on campus, in the US, and abroad. We were excited to have Alice Parker ’47 join us, along with a number of her classmates! While we were students, we sang her works, including a commission for the 25th anniversary of Helen Hills Hills chapel. The Alumnae Chorus was honored to sing in a tribute concert for and with her in 2014. Alumnae Chorus will be doing a US event in 2018 and another international tour in 2019, so we have a lot to look forward to! Next was a class dinner, which President Kathleen McCartney visited. This is our first reunion since she became president. I was so impressed with her warmth and Smith-spirit! Smith is lucky to have her at the helm. After dinner, we returned to our class headquarters for “A Night of Passion” in which classmates shared what they are passionate about. Language, music, nature, quilting and fabric art, writing, and more – each presentation uniquely fascinating. I participated by reading an excerpt from this blog post about meeting up with Smith friends and two Smith related poems, including “Lessons from Mahler”. I so appreciated the warm reception from my classmates, most of whom remember me, if they do at all, as the organist I was in our campus days. It was so affirming to my current poet-identity to have them react so positively to my poems. Author Joanne CoreyPosted on May 27, 2017 June 25, 2017 Categories blogging, musings, poetry, writingTags Alice Parker, Anne Harding Woodworth, change, Ellen Doré Watson, food, Joanne Corey, poem, reunion, Smith College, Smith College Alumnae Chorus2 Comments on Smith 35th!